It was the same for us this week as it was for many, the timely return to school for our adorable, bored, wall climbing offspring. And so it was, that we dropped Evie off for her first day back and wondered to ourselves… “now what do we do?” Last term we decided on a nice pub lunch at the Cheesewring Hotel (a blog for another day), this term, the two of us (missing our very loud tiny person) headed to Looe for a pasty. Of course, it was raining but dressed in our wet weather gear and armed with our new found freedom, we were not deterred. Looe itself had survived this seasons onslaught of holiday makers and now it’s almost deserted car parks and streets seemed a bit like returning the next day to clean up after the party. The newly renovated arcade that a week a go was almost certainly thronging with over excited kids clutching handfuls of 2p’s and ‘totally over it’ teenagers trying to be cool on the point and shoots was now near empty. The familiar fairground style music that called us back as we headed past its slung open doors, melted into the distance as we walked on towards town. Now it was just the two of us, as if we were 18 again and discovering Looe for the very first time. Not much changes here, and I’m fairly certain that statement not only goes back 10 or 20 years but decades upon decades. What some might call ‘kiss me quick’ meets Cornish fishing village, we have got to know over the years and love it for all it’s quirks. There seems to be something for everyone here and it generally doesn’t disappoint if you’re looking for a nice afternoon in a small harbour town. 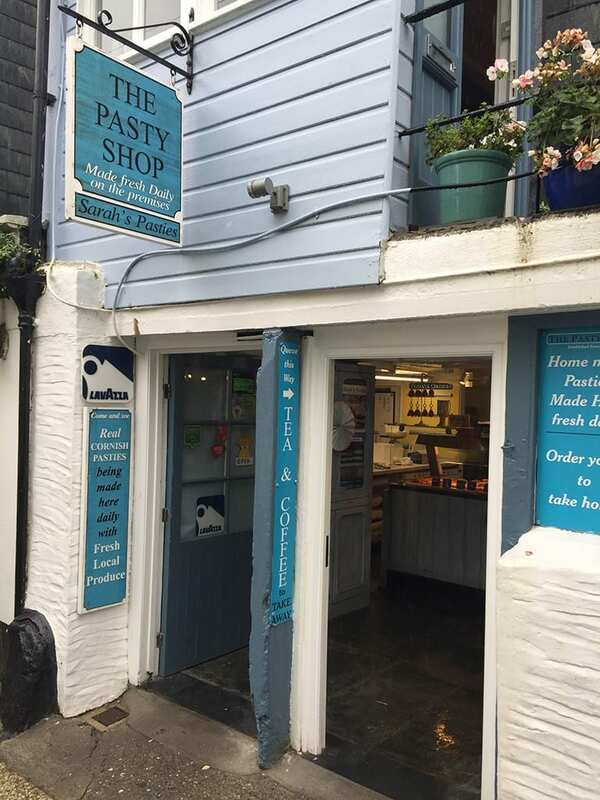 Looe itself is not the subject of our blog today but instead we have decided to turn our attention towards a small ‘hole-in-the-wall’; The Pasty Shop, hidden away at the top of town. It’s fresh white and blue sunny exterior (despite the rain) instantly stopped us, and with an…”Ooooh I bet that’s yummy!” we poked our heads inside. We were met with a clean inviting interior and the most charming of staff. Not really that hungry but held to ransom by the delicious aroma coming from the freshly baking oven, we bought pasties and chocolatey treats. 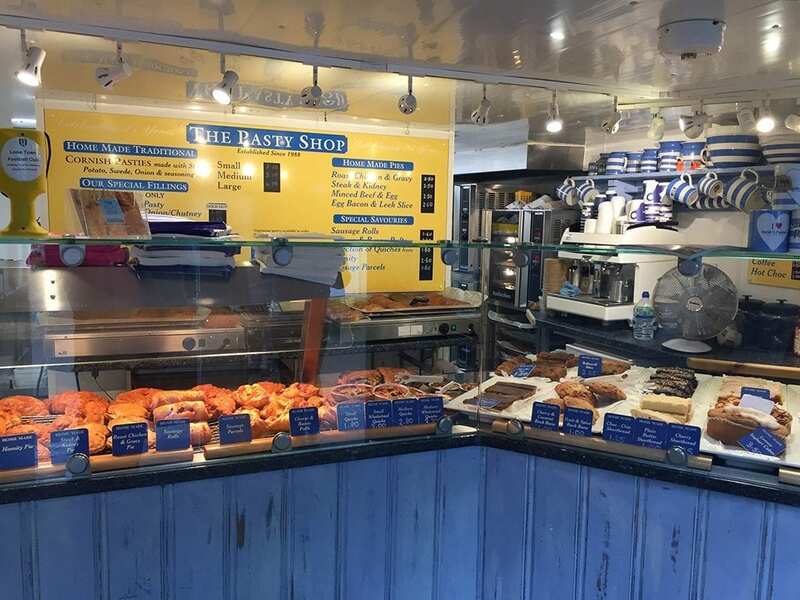 A cheerful face from the open kitchen area joined in our conversation as she stood making pasties while the girl ‘up front’ thoughtfully bagged up our chocolate goodies separately from the hot goods. There are no tables to eat at here, it’s just a bakery counter so we said our goodbyes and vowing to ‘be back soon’ we turned out into the rain and made our way back to our waiting car. We had parked by the river and so we decided the best seat for lunch would be perched in our open boot, the door of which raised over our heads completely sheltering us from the blustery rain. The pasties did not let us down, a peppery cheese and onion – delicate and not overwhelming like most tend to be and a spicy chickpea and lentil. Now, I have to confess I am not a fan of vegan things that were formally un-vegan like cakes, desserts, pastries etc. I was blissfully unaware until it was too late that my chickpea pasty was in fact dairy free, however I openly admit, it was absolutely delicious and the usual dry crumbly pastry as is so often the end result of a vegan pasty was moist and very tasty. The acid test for the pasties integrity: not once was I reprimanded for getting crumbs all over the car. And there we sat, enjoying river, full of wildlife and making the most of the last moments of peace and quiet, the last moments of being people, individuals before collecting our little person from school and becoming ‘mumma’ and daddy again. Changing personas like superheroes but without the red telephone box.